Justin Aquilina is the new gardener/horticulturalist for the Bible Garden at the Australian Centre for Christianity and Culture. The appointment comes after Brad and Derani Ayers, who have been looking after the garden since its creation in 2008, finished up at the end of 2018. The Trustees of the Bible Garden thank Brad and Derani Ayers for their work and passion over the past 10 years. 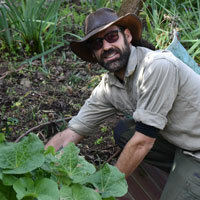 Mr Aquilina will work at the garden for a number of days each month. He said his favourite plant at the Bible Garden was the Holly Oak or Holm and he was hoping to create a beautiful space of abundance at the Bible Garden for people to enjoy. He said he likes gardening because it’s very grounded and he enjoys having hands in dirt and getting back to nature. The Bible Garden was established with a benevolent grant from The Bible Garden Trust, a perpetual trust established by the late Mr Gerald Hercules Robinson. The purpose of the trust was to create and maintain gardens that featured the botany that is described in the Holy Bible, and through this activity to educate Christians particularly young Christians in the Scriptures. The Bible Garden is designed to resemble the Jewish Menorah which is said to represent the burning bush where Moses saw the Angel who told him to lead the Israelites to the promised land.